The 25-year-old Oregon native has been living in Europe since 2013 when he signed on with Team Sky. He'll start the Giro this week. It was called the Flaming Baguette, because of the actual baguettes Ian Boswell and his friends put in the roof rack, and because flames seemed the car’s most likely end. The 1992 Volvo station wagon was loud, but it ran. Three of its tires were the same size; the fourth, a victim of an alpine rockslide and poor inventory at the mountainside tire shop, was a bit bigger. That was fine. It hit the wheel well only over speed bumps, and it harmonized nicely with the loose power-steering belt. Rain would knock the CD player — always loaded with country music — out of commission for days at a time. That was fine, too. Pretty little French plants loved the moisture and took hold in the dash. Boswell bought the Baguette 21 years after it was born, for $800. He’d just landed in Nice, France, with a fresh Team Sky contract but no French visa, so he never registered it. The Baguette took Boswell and his friend and teammate, Joe Dombrowski, around their new city. It was banged into parking garage walls for fun and parked on the street until it gathered so many parking tickets it was given away online to avoid inevitable entanglement with the French legal system. In its resolute ruin, it became a rolling metaphor for the plight of a 23-year-old pro cyclist plunked down in France and expected to thrive. It was, like Boswell himself, injured and out of place yet full of heart and ambition. In August 2012, two weeks after Bradley Wiggins became the UK’s first Tour de France winner, then-Team Sky coach Bobby Julich turned his attention to the West. 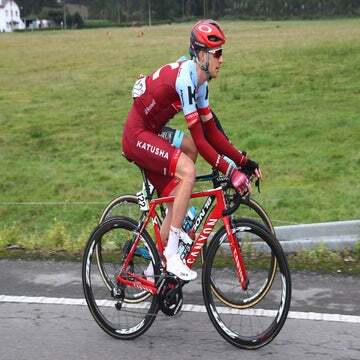 There he spotted a 21-year old-riding in the top five at the Tour of Utah, a rider whose potential would be confirmed weeks later with a fifth overall at the Tour de l’Avenir, the under-23 Tour de France. Boswell was a freckly kid from Oregon, a fisherman and a hunter, a high school basketball and football player who came up in America’s by-the-bootstraps cycling development system. With Sky, he was about to take the greatest mental, physical, and emotional step a young pro could. Despite his meteoric rise, Boswell remains largely unknown in the U.S. And those who have heard of him often assume he’s from the U.K. Perhaps it’s the vaguely British-sounding name, or the British team. Yet to his teammates, he is very much American. For every time an American makes fun of his British phrasing, Geraint Thomas and Pete Kennaugh mock him for playing country music in the team bus. Boswell is stuck in the middle, a man between cultures, an American in France surrounded by Brits. But he’s happy there. And he’s thriving. “IT’S REFRESHING, ACTUALLY, not to have to talk about myself,” Chris Froome says over speakerphone from somewhere in South Africa. It’s the last day of his late February training camp, the end of two weeks spent on the country’s rural back roads with only one other rider: Ian Boswell. Even one year ago, riding a pre-season training camp with Sky’s Tour champion would have been unthinkable for Boswell. His transition into Sky, and into the WorldTour, was anything but smooth. He and Dombrowski arrived at Sky with the assertiveness of youth, thinking they were ready for anything, carrying solid under-23 results — Utah and l’Avenir for Boswell and a win at the Baby Giro for Dombrowski — to back up that claim. But Sky has a wildly different feel from the sort of teams the two came from, and the system they grew up in. Boswell and Dombrowski were among the first neo-pros to come into Sky from anywhere other than Team GB. For the first time, the team had young riders who didn’t already know its systems and policies, or how it controlled its athletes. They were used to long, stress-free off seasons; Sky’s are short and full of training camps. The Americans had their own coaches, now coaches were provided for them. They weren’t. As compatriots Andrew Talansky and Tejay van Garderen fought Porte for the overall win, Boswell finished at the back of the pack for five straight days and then withdrew on the sixth. The team pulled Boswell out of the top-tier stage race calendar and put him back into a series of smaller races like the Tour of Austria and Tour of Norway. Dombrowski never raced the Giro. Racing disappointment was just the start. Boswell arrived in Nice without a social circle to rely on. He had the Flaming Baguette and Dombrowski, and supportive parents and a girlfriend a few thousand miles away, but little help with the everyday stresses of living abroad. “When we first came here, the first half of the year, there wasn’t really much down here besides Joe and me. Now, the team has a huge operation here, with riders and support staff, training rides, team dinners, massage. It’s come a long way,” Boswell says. Changes in the way Sky handled new, young riders came too late for Dombrowski. He bounced out of Sky when his two-year contract was up, signing with Jonathan Vaughters’ Cannondale squad, a smaller American team with a more libertarian, live-and-let-live attitude toward its athletes. It was a better fit for him. Dombrowski had a two-year contract, and Boswell’s was for three years. Perhaps that made all the difference. Boswell, on the other hand, says he’s come to appreciate Sky’s regimented lifestyle. (There’s a reason the bus has been nicknamed the Death Star: The team seems almost martial at times.) “We had support through Axel’s team, and through USA Cycling, but the biggest difference between Sky and Garmin or Trek or BMC is that American riders come up in a system where you’re self made,” Boswell says. “You have your own coach, your own training plan, you figure out how to get there yourself. CRADLE-TO-GRAVE STYLE development systems are common in Europe, but the best American racers often approach the sport differently. Through high school in Bend, Oregon, Boswell was a basketball player (he’s almost 6-foot 3), a Nordic skier, and occasional cross-country runner. He’d get off skis and onto his bike in late March or early April, race all summer, then jump back into ball sports. “Living the way I do now, as a pro athlete, one of the things I miss the most is being a more versatile athlete,” he says. The scattered approach didn’t seem to hold him back. He won his first national time trial title when he was 14, and he says the variety kept him fresh, mentally and physically. “Looking back at the kids I was racing with when I was 15, 16, the kids that were fully immersed, going to Arizona in the winter to train, I don’t think any of those kids are still racing today. It’s easy to get into it too quick,” Boswell says. He raced with the Hot Tubes development team for a year, then when the time came to make cycling a profession, he signed with Bissell. A third place overall at the Tour of Utah in 2010 led to two years with Axel Merckx’s Trek – Livestrong team (now Axeon Hagens Berman), the premier American pipeline for riders with WorldTour ambitions. The pair of fifth-place finishes at the 2012 Tour of Utah and then the Tour de l’Avenir earned Boswell a contract with Sky. He moved to Nice with new Sky teammate Dombrowski, two young Americans dumped into a foreign land and into the beating heart of the British cycling system. THERE IS TEAM BUS music, and then there is Ian Boswell’s music. The two not only come from different continents but from different centuries. There are certain things that even three years in Europe haven’t squeezed out of him. “When I can grab the Bluetooth on the bus, I love it. But I get revoked quickly in favor of Euro pop,” says Boswell, who is a big fan of country and Americana. He sounds a bit crestfallen. It’s clearly a battle he’s lost with some frequency. So what would he force his teammates to listen to if he could get away with it? Townes Van Zandt, “Waiting Around to Die,” he says. It’s fitting, for a pro bike racer. Sometimes I don’t know where / This dirty road is taking me / Sometimes I can’t even see the reason why / I guess I keep a-gamblin’ / Lots of booze and lots of ramblin’/ It’s easier than just waitin’ around to die. For a guy who spent hours of his childhood in duck blinds in the Oregon wilderness, music like that is an audible tie to home. So is his slightly twangy accent, though that’s starting to change, as Britishisms creep into the vocabulary of a man who has, after all, now spent 10 percent of his life on a British team. When he first described the Flaming Baguette, he called it a Volvo “estate” — the British word for station wagon. But he’s fighting to hold onto his roots. Regardless of how well he’s assimilated, Boswell isn’t surprised to hear that a lot of American cycling fans assume he’s British. Nor does it bother him that Dombrowski, his former partner in parking garage car crashing, has seen so much media attention since moving back to an American team. “It doesn’t surprise me. I’ve done it to myself,” he says. “I came to a British team, we rarely race in the U.S. I live full time in Europe. I’ve gotten lost in the shuffle. SPEAKING BY PHONE A few days before heading to Paris-Nice (the race would prove much more successful than his previous attempt, as he pulled up the final, decisive Madone d’Utelle climb for eventual winner and teammate Geraint Thomas) and less than 24 hours after his return from South Africa. He’s in the kitchen of his apartment making an early dinner. “Just cooking to alleviate boredom,” he says. The two-week training camp still stinging in his legs consisted of 951 miles with 85,000 feet of climbing, all ridden with Froome. So a few extra calories probably won’t hurt. Boswell is settled, happy, comfortable. That’s important for a professional athlete. It means that he no longer has to worry about getting his Internet to work, or which random Monday is going to be a French holiday that closes all nearby grocery stores. It’s the difference between those early years and more recent success. Now he can concentrate on work, and improving as a rider. After two weeks in South Africa, Froome sees a bright future for his young teammate. “I think he’s showing himself more and more in the stage races now. I see him developing that even further, becoming an even stronger stage racer in the future, hopefully the kind of rider who can focus on something like the Tour de France, the grand tours,” he says. Good enough to join Sky’s tight-knit group of Tour de France riders, who train and race together through much of the season? That’s always the ambition — the Tour. It has to be. But making the final selection of nine on Sky, earning the privilege of lining up next to a Tour champion, may be more difficult there than at almost any other team. Three years ago, when Boswell came home to an empty apartment after getting his face kicked in at Paris-Nice, that goal seemed impossible. But now the Flaming Baguette, and the difficult times it drove Boswell through, are distant memories. In September, Boswell very nearly won a massive, mountainous stage of the Vuelta a España. In February, he spent two weeks training with Chris Froome in South Africa. In May, he will start his first Giro d’Italia. He is on track to join the A-team of the best grand tour outfit in the world. It seems only a matter of time before country music and the man who loves it make their way onto the Death Star in July. He even has a new car, a Volkswagen Polo 1.2 diesel. All four tires are exactly the same size.